It is no secret that I love and appreciate our American flag, our Pledge and anyone who has ever served our country. Imagine my delight when I received this “surprise” in the mail on Saturday. yes ~ surprises are another love! I met my friend Juliana a couple of years ago at a show. I instantly bonded with her as I was drawn to her art. Her heart is as sweet as her paintings, but when I looked at this set of notecards she sent, my heart sank. You see, there is so much more to her story. Bless you, Juliana, for my wonderful gift! I am so glad to have you as my friend ♥ And thanks for taking the time to share “YOU” with us. HAPPY INDEPENDENCE DAY ! 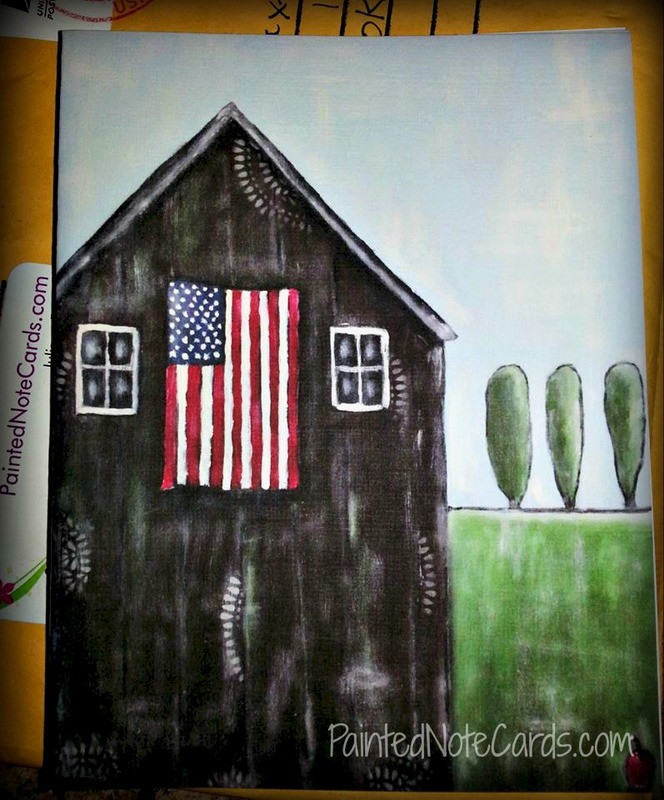 If you’d like to see more of Juliana’s work, check out her website/blog at www.paintednotecards.com . This entry was posted in art, Family, Friends, Friendships, Meet The Artist, Oklahoma, Reflections, Relationships and tagged 4th of July, An American Story, artist, Brazil, Christianity, culture change, Flag of the United States, God, independence, Independence Day, Juliana, lifestyle, New cultures, Paint, Painted houses, Painted Note Cards, The American Flag, United States. Bookmark the permalink. What a lovely share this is… a truly good friend that appreciates what she has in life…. A beautiful story. Even here in Canada I’ve heard stories from people who were not born here but have made Canada their home. It is their stories that remind me how lucky I am to live in this country. Isn’t funny how it becomes so much clearer through the eyes of someone who once was an outsider? Oh yes it is! Lessons to be learned….still. Canada has done the same for me. I’m a prouder Canadian (having come here at age 6) than many of the people born here who take these privileges for granted. Good for Juliana, showing appreciation for a country that has been good to her. How awesome to be a person with two countries! You are American, Maggie….thru and thru. A great post as a reminder to be grateful for what we have. It’s so easy to forget sometimes…. Thanks, Jeannette….you can follow her facebook page, too!